A dealership's best customers return for service after the factory warranty expires and eventually buy another new vehicle there. Dealerships, like Granville Toyota in Vancouver, and fixed ops managers and automakers are searching for the Holy Grail that builds such loyalty. Some manufacturers — including General Motors, Ford and Nissan — work with their dealers on customer loyalty reward programs. Some stores buy software and other tools for loyalty programs and have the vendors install them in their dealership management systems. Other dealerships create their own loyalty programs. Benefits can include points or dollars for each service visit that customers can redeem on future visits or apply to the purchase of a new vehicle. Some programs offer other special discounts, a VIP lounge, free loaner vehicles or a combination of those perks and more. Doug Shorman, general manager of Granville Toyota in Vancouver, says his dealership uses a loyalty program based on homegrown ideas. Shorman opposes discounting prices, either in the showroom to sell a car or in the service department to mollify an angry customer stunned by a $1,500 repair bill. His solution: Replace cash discounts with "currency" to be spent at the dealership. Instead of knocking $800 Canadian off the sticker price of a Highlander, for instance, Granville Toyota gives the customer the same amount in currency to spend at the dealership. Customers can use the currency for accessories or toward a new vehicle, but Shorman says most spend it all on service. Three of every four vehicles the dealership sells have currency attached, with most selling at or near full sticker price (the dealership generally sells 55 to 60 new cars and trucks a month). Some have a combination of currency and a cash discount, or customers can opt for a cash discount only. "When you're financing a $40,000 vehicle, a discount of $1,000 isn't going to make a lot of difference in their payment," Shorman says. "But it gives them a lot of peace of mind when they leave with $1,000 of currency on their card and they know they can come in for their next couple of services and not pay anything." Toyota in Canada does not provide two years of free scheduled maintenance for new vehicles as it does in the U.S.
Shorman estimates that Granville Toyota has awarded $2.5 million Canadian in currency since launching the program nine years ago. On customer-pay service work, Shorman says, the dealership's labour sales per repair order have increased 20 per cent and parts sales 15 per cent since the loyalty program launched. "It actually is pretty impressive," he says. "If I can stop cash discounts and create currency, I win no matter what." Advocates of loyalty programs say they promote higher retention, greater service sales and happier customers. But skeptics counter that a loyalty program, whether from an automaker or a third-party provider, can cost a dealership more than it generates in benefits. Among the more successful in-house loyalty programs is the VIP Club offered at 22 dealerships owned by Sheehy Auto Stores in the Washington, D.C., area. Vince Sheehy, the group's president, created the club 10 years ago after studying several programs. Frank McCarthy, the group's sales operations manager, says the goal was to "create a long-term relationship with the customer and build loyalty to the Sheehy brands. "We wanted to attract them back to our service department," McCarthy told Fixed Ops Journal, "and ultimately give them an incentive to visit us again for their next vehicle." 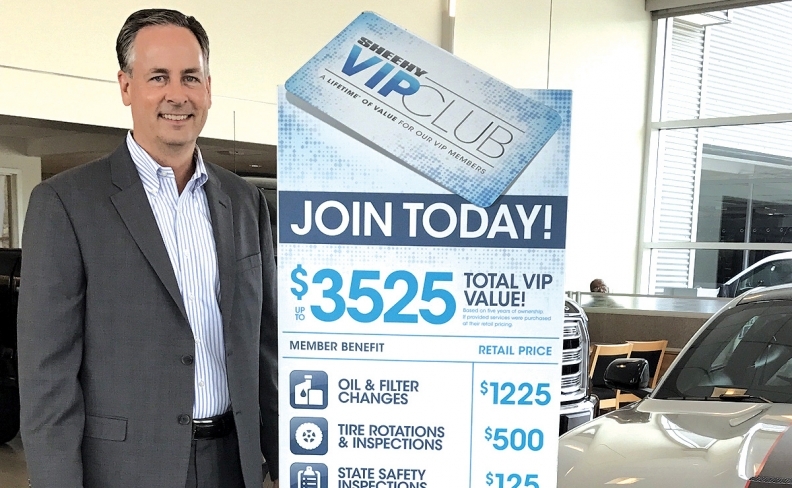 Instead of basing the program in the service department, Sheehy stores sell VIP Club memberships through their finance offices when customers buy vehicles. Customers pay a nonnegotiable fee of US $1,085 (C $1,360)to join (new Toyota cars and trucks come with a slightly lower fee because buyers get two years of free maintenance through the automaker's Toyota Care program). Service customers who bought their vehicles elsewhere are offered VIP memberships during service visits. The membership fee covers seven years of oil changes, tire rotations, a five per cent discount on other service, loaner vehicles, a discount on annual detailing and other benefits, and 300 VIP Bucks toward the purchase of another vehicle from a Sheehy store. Members also earn a VIP Buck for every US $10 (C $12.50) of paid service that can be used toward a vehicle purchase (up to US $800 or C $1,000). Sheehy says the retail value of the benefits package is US $3,525 (C $4,420). About half of Sheehy's new- and used-vehicle buyers join the VIP Club, which has more than 86,000 members. Nearly half of service visits are by VIP members. McCarthy says one-fourth of VIP repair orders include the purchase of service items beyond what is covered by the loyalty program. "It's a phenomenal retention tool," he says. Bill Housholder is fixed operations director of Ganley Management Co. in suburban Cleveland, which oversees the 29-dealership Ganley Auto Group. He says he also opposes discounts, and sees most loyalty rewards programs as a form of discounting. "I don't think they drive loyalty [among dealership customers] the way a lot of people think they do," Housholder says. "Customers aren't going to come in more often when they only need an oil change once a year, just because we have a loyalty program." The only Ganley dealerships that have loyalty programs, he adds, are its Nissan stores that belong to the automaker's One to One Rewards plan, which is tied to other factory initiatives. Ganley's Ford and Lincoln dealerships dropped out of those brands' loyalty programs, Housholder says, because they cost the stores money without noticeably improving service business or customer loyalty. Ford's plan, he says, forces dealerships to engage in "discounting discounts. If you keep cutting your margins, that is less money you have to do the things you need to drive your business." Ford Motor Co. spokeswoman Sherrice Gilsbach says the automaker's Owner Advantage Rewards program enables dealerships to compare the costs of future discounts with those of discounts at the time of service. "Often, dealers say the earned discounts are too expensive, only to truly find out that their own unmeasured discounts are even more costly and do not drive repeat business," Gilsbach says. She adds that more than 1,800 Ford and Lincoln dealers and 4.7 million vehicle owners are enrolled in the program. Members visit participating service departments 37 per cent more often than nonmembers, spend 21 per cent more and spend US $31 (C $38) for every dollar they redeem, she says. But Housholder asserts loyalty programs create different classes of customers, and can lead to resentment among those who don't get the lowest prices or the most perks. "We just need to continue providing better service than anyone else in the marketplace," he says. "Customers have told us that when someone does a good job, most of those customers will not leave you for a couple of dollars to get a better price." A loyalty program, Housholder adds, won't persuade customers who have gotten lousy service to come back: "The key is to not allow them to have a bad experience."